Radar measurements made with high spatial resolution and large dynamic range at the Jicamarca Radar Observatory near the time of reversal of the electrojet current provide further proof that the gradient drift instability is in fact responsible for the type 2 irregularities. Echoes are received over a much wider range of altitudes at night than during the day partly because of the change in character of the background electron density profile and partly because of recombination effects, which can be important during the day. 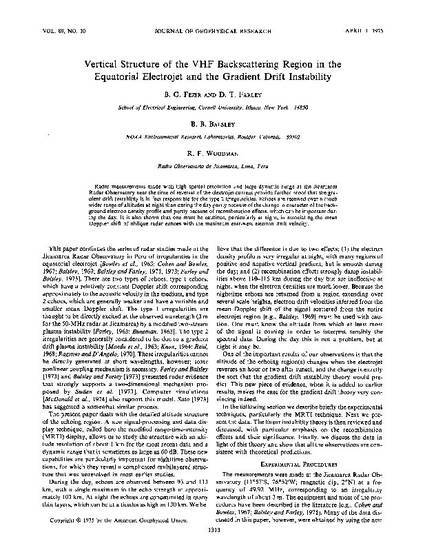 It is also shown that one must be cautious, particularly at night, in associating the mean Doppler shift of oblique radar echoes with the maximum east-west electron drift velocity. Fejer, B. G., D. T. Farley, B. B. Balsley and R. F. Woodman, Vertical structure of the VHF backscattering region in the equatorial electrojet and the gradient drift instability, J. Geophys. Res., 80, 1313, 1975.